What Matt and I really appreciate about this ad-free model is that we are under no pressure to deliver a set number of page views, or generate traffic just for the sake of clicks. When there’s not much to say or write about, we’re going to say so. And when there’s some serious weather threatening the area, we’ll write and cover the heck out of it. We’re never just going to write filler stories—we aim to reduce the clutter in your lives, rather than add to it. Not much will change this year. 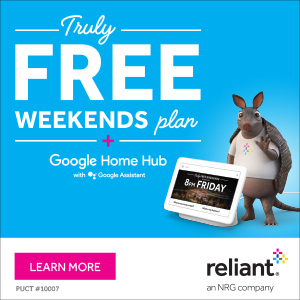 As long-time readers know, we will (very) occasionally highlight an electricity, or home service or energy management solution that Reliant offers when it’s relevant for you, service that Reliant offers, and our site will feature deals from the company—right now, that deal is free weekend electricity and a Google Home Hub at no cost to you. Reliant and its president Elizabeth Killinger want to support what we do, not get in the way of it. Reliant shares our mission of keeping readers informed and prepared, no matter what the weather brings. They’ve been a great partner for us over the last 18 months, and we’re excited to have them back with us for 2019. Obviously your readers would like to thank Reliant. How do who do that? Thank you Reliant! And thanks to you both for a great website. Fantastic news Thank you Reliant! We love Space City Weather! This website is my go-to for weather news for exactly the reasons written above. I’m very happy for Eric and Matt. But mostly for myself. Keep up the good work! Thanks so much, Reliant! Your sponsorship is much appreciated!! And, of course, thanks to Eric and Matt for keeping us well-informed without any hype. That’s also much appreciated! THANK YOU Reliant for sponsoring such quality news reporting. And THANK YOU Eric and Matt for your passion to keep your neighbors meteoroLOGICALLY educated and informed. Fan for life! Thank you, Reliant! I’m so glad to have Eric and Matt and Space City Weather!! Thank you Reliant. This is such a gift for us who want the weather without the hype. And thank you, Matt and Eric, for keeping it real! Three Cheers for Reliant! Many of us rely on the weather reports on this site, which is much easier to digest than local newscasts and more detailed than weatherbug and related sites. 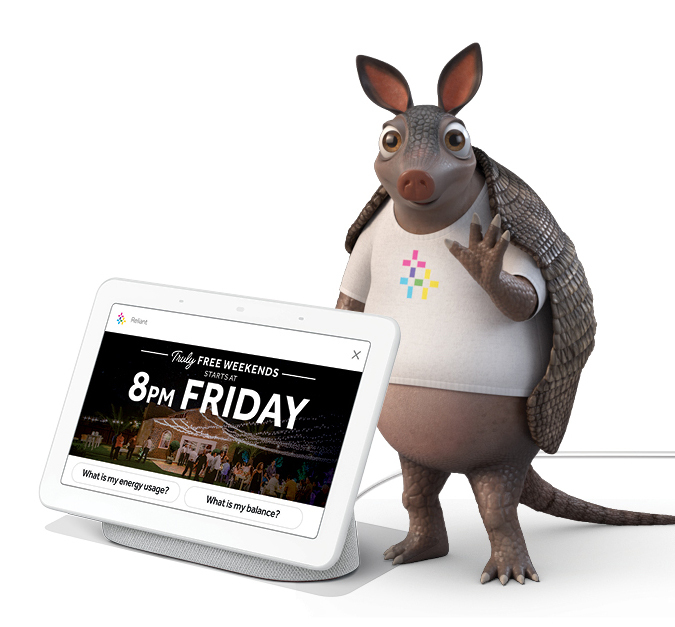 Thanks to you guys and thanks to Reliant, but armadillos carry leprosy. Oh Greg, it’s a cute caricature of a dillo which is the official State of Texas mascot. While it is recommended not to handle them bare handed, they’re beneficial critters. Go Reliant! Go Space City, you guys rock! Yay for armadillos! Thanks Tonya, we think Hugo’s pretty cute, too! We can’t wait to pass your compliment on to him. Hi Greg- you’re right. Armadillos can carry leprosy. However, Hugo, our latest Reliant team member, just got a clean bill of health – and is pretty fun to hang out with! Fantastic news, I love reading your blogs. Wonderful! I’ve been a Reliant customer for a long time, and this sponsorship just reinforces my loyalty. Thank you Reliant! Space City Weather is my go to site each morning for the local weather forecast. Concise, detailed, local and usually reasonably accurate. Thanks Reliant for your continuing support for this public service. Thank you Eric and Matt and thank you Reliant for sponsoring a very worth while and informative site. Really appreciate this site and Reliant’s support of it. Great partnership and one that benefits all of us. I look forward to seeing the daily report even if here is nothing to report. So glad the day I found out about Space City Weather! Now I don’t have to make a point of seeing news on tv as I know the reporting here will be true! Thanks Eric and Matt and also to Reliant! I am a Reliant customer and luv that they provide this service for us to follow! Great news! Thanks, Reliant, for another year of reliable weather reporting! Reliant, thank you! Eric and Matt provide great information. Excellent! So proud Reliant is committed to great service. Thank you! Thanks Eric and Matt for another year of calm and reasoned weather reporting–you are my daily go-to. And thank you Reliant, our long-time power provider, for your support of this valuable community asset. Thank you Reliant, this is the only real weather report. Thank you Reliant. You are getting my business.